(Reuters) - Mexican authorities displayed in public a top drug lord Tuesday whose arrest this week they hope will mark a breakthrough in President Felipe Calderon's bloody campaign against powerful cartels. 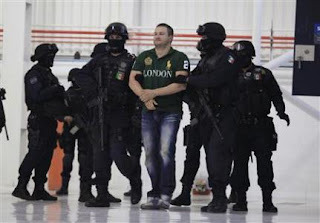 Edgar "La Barbie" Valdez, a Texas-born 37-year-old, held back a smile as he was led handcuffed by masked federal police before reporters, flanked by fellow suspects, sophisticated weaponry and plastic packages of drugs. Wearing a green polo shirt, jeans and sneakers, Valdez, nicknamed "La Barbie" for his fair complexion, grinned openly as authorities discussed his capture outside of Mexico City on Monday evening. "He has been detained, and this operation closes a chapter in drug trafficking in Mexico," senior federal police official Facundo Rosas later told local broadcaster Televisa. It is unclear whether Valdez' arrest, Calderon's second coup this year against cartels, can staunch rampant drug violence that threatens Mexico's image as it struggles out of recession and seeks to hold on to tourist revenues. Over 28,000 people have died since Calderon launched his crackdown in late 2006, and bloodshed shows no sign of stopping as rival gangs battle for control of smuggling routes. Authorities said Valdez, a leader of the Beltran Leyva cartel based in central Mexico, trafficked a ton of cocaine each month and was responsible for "several dozen" murders. His arrest follows an operation in July that killed Ignacio "Nacho" Coronel, No. 3 in the rival Sinaloa cartel.